Provided by Allen Browne, Nov 2007. Last updated: Feb 2011. Soundex is a standard algorithm for finding names that sound alike. 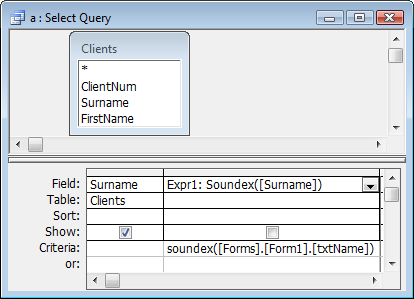 Access does not have a built-in Soundex function, but you can create one easily and use it inexact matches. To verify Access understands the code, choose Compile on the Debug menu. You can now user the Soundex() function like any built-in function. The screenshot shows how to find the clients whose Surname matches the txtName box on Form1. For background information on Soundex, and an explanation of how the algorithm works, see http://en.wikipedia.org/wiki/Soundex. Update Feb 2011: Albert Kallal (MS Access MVP) has another version of Soundex for use in web forms (introduced in Access 2010. See A Soundex Search for Access Web services. 'Purpose:   Return Soundex value for the text passed in. 'Return:    Soundex code, or Null for Error, Null or zero-length string. 'Argument:  The value to generate the Soundex for. 'Author:    Allen Browne (allen@allenbrowne.com), November 2007. Dim strSource As String     'varText as a string. Dim strOut As String        'Output string to build up. Dim strValue As String      'Value for current character. Dim strPriorValue As String 'Value for previous character. 'Do not process Error, Null, or zero-length strings. 'Retain the initial character, and process from 2nd. 'Examine a character at a time, until we output 4 characters. 'Return the output string, or Null if nothing generated. MsgBox "Error " & Err.Number & ": " & Err.Description, vbExclamation, "Soundex()"
'Pad trailing zeros if no more characters. 'Return nothing for "A", "E", "H", "I", "O", "U", "W", "Y", non-alpha.